There I was shopping with a friend who was (and continues to this day to be) tall, blonde and pretty. A triple threat. So tall, blonde and pretty in fact that people were gawking at her as we walked around the city because they thought she might be 'somebody'. Nothing new for her. She confessed to me that people used to be so brazen - when she was in her 20's - that they would get right in her face and ask point blank who (or which famous tall blonde actress) she was. Best thing about our girl though? She's pretty, but she wants other people to look pretty too. I've found that this is not always the case with pretty people. Sometimes, they hog the spotlight all for themselves. And we've all had our fair share of those types of situations (and people), n'est pas? It's not fun. Now, getting back to our friend, her generous nature makes her a fantastic person to shop with - because she'll tell you truthfully if something looks good (aka, Green light. ), bad (Save your money.) or just alright (Ditto - Don't bother.). So there we were shopping at Saks 5th Avenue . The flagship one on 5th Avenue in NYC. It may have been my birthday. I may have been a little miserable about it being my birthday. Who knows? After buying up a few skirts and a few pairs of black Wolford Matte Opaque 80 tights (The perfect black tights because they keep their promise about being both matte and opaque. I can't count how many times I've wasted money on less expensive ones because they billed themselves as either matte or opaque or BOTH and they were NOT any of those things. Quel disappointment! Not sure if Edie Sedgwick wore Wolford, but she should have. Remember when it comes to tights, a matte leg is the most flattering. ), we made our way down to what was then the ground floor level Cosmetics department where we were accosted by an aggressive woman trying desperately to sell us $500 face creams. She was most definitely one of those doesn't-take-NO-for-an-answer types. Thankfully, we escaped to a more low key cluster of makeup counters. Having worked in sales for a long stretch, let's just say I don't respond well to hard sell, aggressive types - They instantly turn me into a 'talk to the hand' kinda gal. Rude yes, but necessary and effective in instances such as the one with the $500 face cream lady. Well, luckily for me, one of those counters - in the low key cluster section - happened to be Cle De Peau Beaute and that's where I found the world's best concealer for under eye circles in the history of modern makeup. I say this as someone who had under eye circles in her 4th grade school picture and has subsequently tried just about every brand of under eye concealer on the market. Most don't work - They either don't stay put or they give you the dreaded reverse raccoon eyes (white circles, instead of dark ones, because your concealer is far too light). 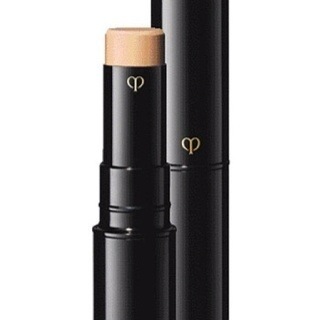 Like those Wolford tights, the Cle De Peau Concealer may be more expensive (It retails for around $70.) than most, but it's so worth it because it actually does what it's supposed to - It comes in 4 uber natural shades (No reverse raccoon eyes!) and covers those pesky under eye circles that make you look sad and tired. It won't make you look like a movie star, but it will make you look happier and well rested. And truthfully, who doesn't want to look happier and more well rested?